I have been an avid reader of blogs for a long time and there is rarely anything I see that I haven't seen before. Now that Pinterest is around, I think most people feel the same way. I can honestly say I have never seen anything like these cute chocolate dipped turkey pretzels. I even did a Google image search to see if Google could pull up anything like them. So besides the fact that they are adorable, Beth gets extra points for surprising me! 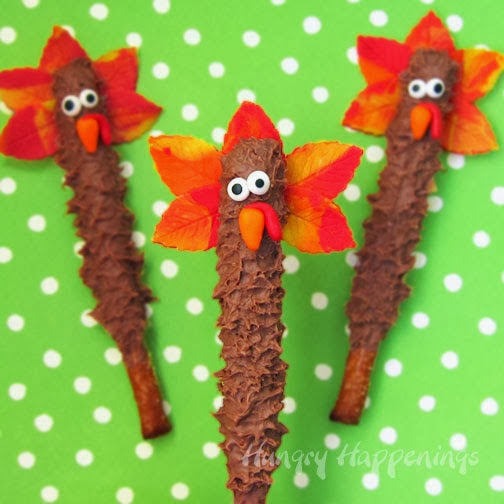 And extra points for making the turkey feathers out of Fall leaves! You can check out how to make these turkey pretzel pops over at Hungry Happenings.